Replica vintage rings can be beautiful. Most 1920s replica wedding rings reflect the geometric design and strong use of symmetry that was popular in art deco jewelry. Known as the Roaring Twenties, the art deco period was a time of strong reactions against the strict ideals of the Victorian era. These feelings were reflected in jewelry as designers did away with free flowing curves and floral motifs replacing them with bold dramatic designs and strong colors. The 1920s replica wedding rings made today not only use these precious gemstones but combine different colored diamonds with white buttons for a truly stunning effect. Antique Engagement Rings offers an exquisite replica Art Deco platinum wedding band that has an alternating pattern using twenty six white and green diamonds. The diamonds, totaling .40 carats, are elegantly bead set with a beautiful milgrain edge. Each side of this awe inspiring ring has an elegant swirling design. 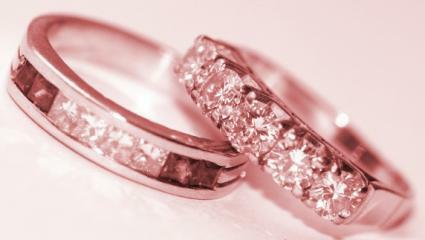 Fay Cullen Jewelry has an extensive line of replica wedding bands from the 1920s. Many of these wedding rings have the dramatic impact of colored gemstones along side of white diamonds. A beautiful example of this style ring is their Art Deco sapphire and diamond wedding band. Fiery diamonds and sparkling sapphires are set in your choice of platinum or 18K white gold. The exquisite stones are set in alternating square and circular shapes and have beautifully detailed edges. This elegant wedding band can also be made using rubies or other gemstones of your choice. The beauty and style of 1920s replica wedding rings makes them an ideal choice for anyone that loves the look of Art Deco design jewelry.